Today I want to share a number one frustration with you guys. I live in Holland and we don’t have Pottery Barn over here. Nope, no where to be found in the whole of Europe. No store, no catalogue, nothing. And looks what happens when I try to go the the Pottery Barn website. Their server recognizes my server as being non-US and I am not even allowed access to their site!!! Come on, that is a grave injustice. How can any self-respecting home deco blogger keep up with the current trends when she can’t even do a proper Pottery Barn knock-off. I feel so disadvantaged, it just isn’t fair. But I tricked them this time!! Ha, Pottery Barn, you thought you could keep your ideas limited to your own continent didn’t you, well I got you on that. A few weeks ago, I saw a giveaway on the beautiful white loving blog Dreamy Whites. 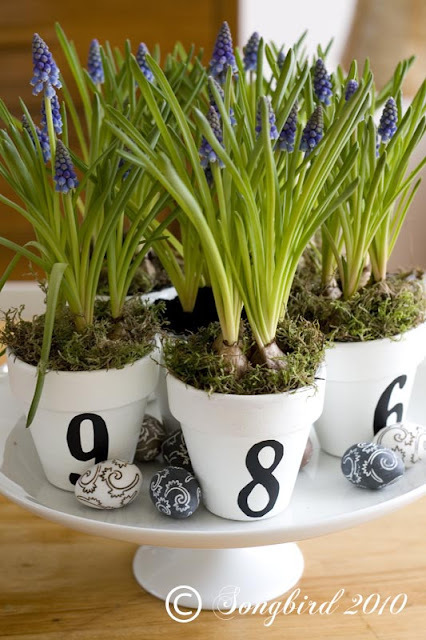 You could win this lovely numbered herb pots from Pottery Barn. Image ‘borrowed’ from Dreamy Whites. Cute hè! I used plain old terracotta garden pots in a small size. You know the ones I mean, any gardener has a variety of them in every size in their garden shed. I bought mine new, and they were only 50 euro cents each. I painted them and cut numbers from the black chalkboard vinyl that I had left over from my kitchen project. I love those little pots. They are so versatile. They would come in handy in my craft room to organize my supplies in a stylish matter. Look wouldn’t that make you want to paint or draw immediately. The pots have a hole in the bottom so I used a small glass candle holder as a vase inside. See, you can just make out the edge of the glass in this picture. And can you believe that these are old-fashioned carnations. I just fell in love with that deep passionate red of these large flowers. I never would have thought I would ever buy carnations but I love these. Of course I could use the pots as a subtle reminder as well. This is one way of making sure my Love doesn’t forget my birthday! (this is Euro spelling, my birthday is in August). Or is that a bit too much? I think I’ll settle for using them in my first spring/Easter decoration. So what’s your take on Pottery Barn and their exclusiveness issues? Let’s meet and talk…. Watch out PB this Euro blogger is on to you!!! Niet te geloven! Wat denken die daar in de USA? Ik geloof dat jij toch de veel betere ideeen hebt als zij! Die potjes zijn hartstikke leuk geworden! Well done! They look great. So simple and so much fun. ik heb even gegoogled. Je kunt wel op de pagina van PB Canada komen maar die heeft geen webshop dus daar heb je niet veel aan. Great job! I like yours better than PB! This is just too good!! If you want my opinion these are MUCH BETTER than Pottery Barn any ol' day…YOU made them!!!! i was wanting some as well…thank you for sharing this simple, easy idea! You did a fabulous job with these! I can't believe you are unable to even look at the site – that seems a bit ridiculous to me. I like PB, but to tell you the truth they are overpriced and I think they are reading blogs to get a lot of their 'new' ideas! Your pots are very cool, Marianne!! What a clever idea. Though you may miss Having a Pottery Barn, you are not missing the prices. Many bloggers here get inspiration and make their own as you have done. If I come across anything, I will let you know! This may just be my favorite project for the week! I am definitely doing this – thx for the inspiration! Oh I like everything you did. Perfect little pots. Who know PB wouldn't let their website overseas. If I had a catalog I would mail it to you. I live 100 miles from the nearest store and have never gotten their catalogs. those pots are just too cute! I love flowers, particularly bulb flowers early in the spring! We all are waiting on spring, aren't we? Wow, these are unbelievably cute! Good job! That's so unfortunate that you can't even see the website…oh well. You showed them! Marianne, I can feel your pain! I live in Bulgaria and many times all the places where fellow blogger seek inspiration are out of touch for me. Websites, stores that won't deliver internationally, and so on – you know what I mean. I, too, feel it's very unfair. However, I LOVE what you've done with the pots – they are adorable! That really is a great idea…I've been painting those terra cotta pots white or an occational pastel for years. But they are definetly right in style with the blk numbers on them. I'll have to make some! Great post (as usual) – and necessity is really the mother of invention. I guess we always want what we can't have, there's a PB outlet 20 minutes from me and I never go because it's an overpriced bore. I actually sold all my PB stuff at a yard sale! I'd rather follow your creative lead. Email your mailing address to me privately. I was an English major – sorry – you've got a typo below – it's Show and Tell, not Tall!! Nu weet ik in ieder geval dat het niet aan mijn verbinding ligt als ik deze melding krijg. Jammer dat PB zo parnoïde is. We mogen zelfs de site niet bekijken. Je knock of is ontzettend leuk! PB eat your heart out! Super duper! They really are darling! Clever bird you are! You are just brilliant, Marianne! They look fabulous! Great job…can't wait to see your next project!! i absolutely have been so inspired by this blog! thank you!! I love your little pots! Clay pots are one of the coolest things around to transform into something special, and you accomplished that here. Good job! I can't believe you can't even visit their website! That is just incredible. Well I'm glad you were able to find your inspiration anyway! They all turned out beautifully! And I just love them with those little grape hyacinths. Well, you're too smart for PB! These are darling! Ik natuurlijk gelijk ook ff proberen, want mij staat toch echt bij dat ik in een ver verleden daar toch wel eens gekeken heb…en totaal niet onder de indruk was…Tuurlijk heb jij gelijk, ik kom er ook niet op, maar wat geeft dat als wij hier bij jou die mooie potjes zien! Ook leuk om cadeau te geven, met zo'n datum, ga ik onthouden! Fijn weekend! Pûh, wij hebben die hele PB niet nodig! We hebben jou toch! Superleuke potjes! Kom er maar weer eens op! Bedankt weer voor deze keileuke tip en een héél fijn weekend! Love that you showed so many ways to use those. Great project! I'm not sure if I should tell you this or not….the numbered spice jars aren't from Pottery Barn. They are from Anthropologie. Sorry! I really love your version. Especially with the beautiful Spring bulbs planted inside. Just lovely!! So cute! I love how they turned out! That is just crazy that you can't even view via the internet! Crazy.. Okay, first I love your little pots but what really makes them is all the hard work that went into that photo styling! Gorgeous!!! What greenery did you use with your carnations? Second, I'm not sure if you really want to get onto PB or if it's just fun to include in your post but here are some thoughts: Have you visited knockoffwood yet? You can get a TON of PB inspiration there. Have you tried pretending you are from another country by searching for PB under say "google.ca" (Google Canada)? Or just doing an image search for PB stuff? I have no idea if that would work but that's what I would do for my PB, West Elm, and Williams Sonoma fix! I think that yours look incredible – Well done! That is really odd that you can't access the site. I can access it from here in Australia and we are in the middle of nowhere! Maybe try on internet explorer because I have issues like this when I use Mozilla…worth a go I guess. I hope you have a wonderful weekend and thanks for visiting. See you again soon! Great job!!! I love how yours turned out; so creative and so versatile! I'll have to 'borrow' your idea and make some for myself I think! That's terrible you can't even look at the website. That's just wrong. I wish we had a Cath Kidston store here. Oh, sigh. Anyway, your pots look better than PB's, and certainly better priced. You showed them. That looks fantastic. Especially when you put the grape hyacinths in them! Just terrific. And yes, PB better watch out! Thank you for your visit!I love your blog! I love your PB knock-off! And soon you will be getting a box with a certain wallpaper you've been longing for. Can't wait to see what you're going to do with it! I just LOVE them. They have such a bright punch to them! Help. My brain must be mush! Great post! I love the little pots. They're beautiful…love it. You did such a good job, I actually like yours better. You did a great job on these! I love all of your creative ideas for them. What a lovely blog! Do you know what they say :"Need is the mother of invention". I feel the frustration with the companies that do not ship to Europe. But you did a good job. Have a lovely weekend. Great job. Maybe we could look into shipping you on of our copies of the PB catalog. After all, PB can't possibly monitor that! or just bring you lemonaide? everything you do i love & adore. i know the word "inspiration" is highly used in blogland, but you really are. beautiful work as always. Oh Marianne I love this!! So simple!! GREAT job! How wonderful this project turned out ~ so full of possibilities for use! You do have a lovely place here! Very nice! We should ship our old copies onto you! I would even grab them out of the PB store in the mall to send… just to see what you would come up with. Yours is better! BEAUTIFUL – like your version so much better and more practical. I love it!!! I may have to give this one a try. Very cute! I can't believe you can't even look at the site! That's just crazy! I love your PB pots and your beautiful flowers that planted in them. That's just not fair that you can't access PB, do other big online decorating sites do this also? Guess you can't get on their mailing list either. I'll gladly mail you my copies! WHO NEEDS POTTERY BARN…THEY ARE VERY HIGH ON MOST THINGS AND WHEN YOU CAN PRODUCE THAT….I WOULD SAY POTTERY BARN NEEDS YOUR TALENT MORE THAN POTTERY BARN REFUSING YOU THE RIGHT TO LOOK AT THEIR THINGS. Those little pots look wonderful! Is your birthday August 14? That's my husbands birthday, too, and a friends. There are a lot of nice people born on that day! I have a spare Pottery Barn catalogue if you'd like it – just let me know! There's a lot of inspiration in it. I saw those numbered pots on Dreamy Whites also….you did a wonderful job! And probably for much, much less $$ also! Hurray! They look wonderful with the flowers!!! Cute!!! A fantastic idea…I notice that amazon sells chalkboard contact paper. I might have to borrow your idea. Thanks! These are simply stunning – Love everything about them! You did a fabulous job! They're just darling!! Love me some numbers!! I'm in love with your work! Very Cute!! You have a really fun style and many beautiful projects on your blog!! I will most definitely be checking back!! Love this idea! And, I cannot believe you can't even access the PB site. Crazy! I live in Athens Greece and can get the potterybarn site from here. Come on over and we can have some coffee while checking out the site!!! Wonder why you can't get it. Europe is Europe, right? Funny! What a wonderful project! I love it. I am wondering, though, what kind of paint did you use that wouldn't be toxic for your plants? I want to paint some pots like this for growing herbs for cooking, but I am concerned about what the herbs would pick up in the soil from the paint inside the pot.